About 3+ hours into our trip we stopped for dinner and our car decided it didn’t want to go any futher. As we were in WV I was reminded we weren’t back in the northern Virginia rush of life. SO many people were there to help us and were so generous with their time. One gentleman even drove Brian to the auto parts store twice and then helped him fix the car. This ended up being quite a delay and we were in the gas station parking lot for over 3 hours… so needless to say it made our return home much later than expected! So… This will be short and sweet! I didn’t get the box this week and I’m a bit.. no actually very… sad about it. 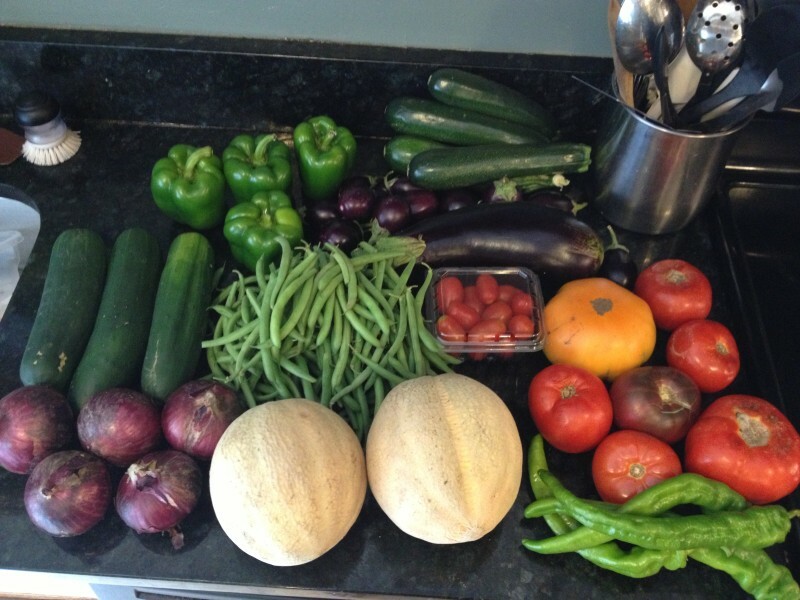 It looks like a fantastic mix and delicious veggies! I hope all enjoy it! And as per usual, here are a few recipes! Tomatoes and Cherry Tomatoes – For lunch the kids and I will eat one of those large juicy tomatoes with salt for lunch! We love them and they are so delicious! I never put them in the fridge because it dulls the taste. Besides they taste even more vine fresh when they are warm or room temperature! One of our favorite salads is a Mediterranean summer quinoa salad that uses lots of tomatoes and cucumber and onion! Red onion specifically! Cantaloupe – Mmmm! I LOVE a good fresh cantaloupe! My mother just got back from Spain and one of their specialties is cantaloupe pieces wrapped in prosciutto. I know it sounds a bit odd, but it is so delicious! It’s light with salt and perfect for a light dinner, appetizer or with wine and cheese! Peppers – As summer wears on peppers and eggplant tend to be the hardest for me to use because we get so many of them! I’m always looking for new ways to prepare them that my family will enjoy! One of our favorite is stuffed peppers. Sometimes is’s a la breakfast with eggs and sausage in them and then a slice of cheese melted on top and other times it’s a la taco with ground beef or venison with black beans, corn, and taco seasoning topped with fresh chopped tomato and lettuce. We’ve also done Paleo Pizza Stuffed peppers which are also a favorite! Hot peppers– Hot peppers can be added to just about anything to add flavor and spice. We like them in eggs, chili, the above stuffed peppers, salads, on top of pizza, and so much more! It’s also strung them with dental floss and hung them above the kitchen sink so that they dry out and I can use them all year. Sometimes they do proliferate too quickly to eat them all before they go bad! Eggplant – A few of the ideas I cam up with last year for the eggplant besides Parmesan! Included Eggplant dippers, Eggplant Meatballs which are a great meatless option! And Grilled Eggplant with Tomatos, Basil and Feta. I do have some other ideas as well, but I’m going to safe those for the next email because we will have plenty more weeks of eggplant to come! Cucumbers – We Really like these with onions in a quick pickle mixture to marinate overnight and eat as a crisp side with dinners the rest of the week! You can use the recipe for pickled beets for the pickle mixture and use cucumbers and onions instead of beets. Zucchini – Since we talked about stuffed peppers, you can do the same with zucchini! Here is a recipe option for stuffed zucchini which we really liked. Just make sure you have enough zucchini because my kids ATE IT UP!!! Red onions – These onions are great for salads to add color and they don’t have quite the bite that yellow onions do. It’s my favorite to use them in the Mediterranean Quinoa salad I listed above. Green beans – Another favorite in our house! Green beans! I feel like these and peas are the most common request for dinner veggies. A friend of mine gave me some spicy pickled green beans and they were fantastic! I’m planning on doing another batch of these. I LOVED these as a snack after naps when the kids got up or just for a quick bite to eat. Healthy and super tasty! However… as I write this I can’t seem to find the recipe. I will look into it some more and will provide it when it’s located! Hope this helps with some ideas and I also hope you enjoy your veggies this week! Hmmm…. so your car is feminine? Is she French then – LA voiture? Otherwise it would be masculine in Spanish – EL coche (in Spain) – EL carro (in Central/South America). Just curious about car gender! Not sure about mine!